Editors' Picks: Our 10 Favorite Salons in the U.S.! We all want to look our best, but there is only so much that you can do on your own. If you want a fresh new look that will really make a splash or just have some of the work done for you, the salon is the place to be. 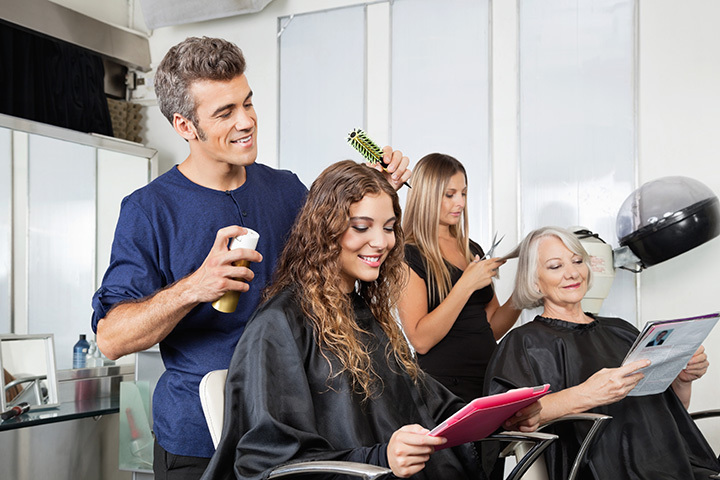 A lot of people have a favorite place to go for a haircut, or a dye job, or a mani-pedi, or a facial, but all salons are not created equally. Here you will find some of the best beauty salons in the country, and possibly a new favorite. If you have $400 to spend on a haircut, this salon run by the legendary Cuban hair stylist Oribe is probably where you will get the most bangs for your buck. Oribe has other locations, but in Miami you can expect to see some celebrity regulars, like Rhiana, Jennifer Lopez, and Anne Hathaway. Named the best beauty salon in all of California for 2014 by Elle Magazine, Sammy Oliver's Salon in San Francisco is a world-class destination for cuts, blowouts, and a wide array of coloring services. Oliver herself draws inspiration for her work from many fields, and is joined by accomplished stylists Wes Pine and Chris Shepherd. Be sure to check out their proprietary line of R+Co hair products. You don't just take care of your looks when you go in for a treatment at Sprout; you are also taking care of the Earth. All of the products used at Sprout are certified organic, which is important not only for those who are environmentally conscious, but allergic to many of the harsh chemicals in many shampoos and dyes. Hair care isn't the only thing green here though, the salon's office is paperless, the tinfoil from color treatments is recycled, and even parts of the building are recycled. Every head of hair is unique. If your unique style displays an African heritage, Edris Nichol's salon in Manhattan has been called one of the top one hundred salons in the country by Elle magazine, and the best salon in New York City for African-American Hair by Refinery 29. The staff consists only of experienced colorists and cutters who are trained to work with all varieties of hair. For a true spa expirence, Thomas Calvert's full service spa is a little off the beaten path, but that arguably adds to the potential for relaxation at this hidden gem. Ranked as one of the best locations for facials as well as full body massages by Northern Virginia Magazine. The entire staff is trained in advanced massage techniques, and pride themselves on setting the spa apart through highly customizable treatments and luxurious customer service. Located in the Augustus Tower of the luxurious Caesar's Palace Resort and Casino, Color is part of the Palace's spa offerings. Color offers both men's and women's cuts in an opulent setting created by renowned Hollywood designer Faye Resnick. Specialties include a "Loveseat Pedicure" great for close friends or couples, as well as the tropical Hawaiian Pedicure which includes a star fruit milk bath, a pineapple sugar rub and a hot stone treatment with coconut massage oil. Ranked as the area's #1 destination in both the Color Salon and Hair Salon categories by Dallas citizens on the Dallas A-List, Blaine's is a solid choice for anybody wanting to look their best. Owner Blaine Schlaudt has over 20 years of experience in the field, as does his wife Sharon. Together, with their experienced and inventive staff, they provide extensive hair services, facial treatments and make up application, and full body waxing. A four-time winner of Best of Boston awards from both The Improper Bostonian and Boston Magazine, this chic and Newbury Street salon provides great value along with its service. The salon's proprietors, Michelle Lee and Eva Mustafi are both prominent members of the Boston beauty scene, and have brought together a talented staff. But perhaps most appealing for frequent salon visitors are the Platinum VIP plans which offer unlimited visits for just one annual fee. Unfortunately, it is almost impossible to book an appointment with Gary Manuel himself. Bookings have to be made more than a year in advance, and he is usually not looking to take on new clients. However, it is possible to make bookings at the Institute and work with one of the talented stylest studying under Manuel. But they do more than hair, full on spa treatments are offered at the Aveda Institute, located on premises. Aimed at fashion conscious men looking to really enjoy their haircut, this unique location invites patrons to "get buzzed" and enjoy a discounted drink while receiving haircuts, beard trims, and a wide range of "manscaping" options. While the draw here has more to do with the atmosphere than celebrity stylists, you can still count on a top-notch cut.